Warner Bros. announced Monday that the next 'DC Universe' animated film, Batman and Harley Quinn, will be making its world premiere at San Diego Comic-Con on July 21. 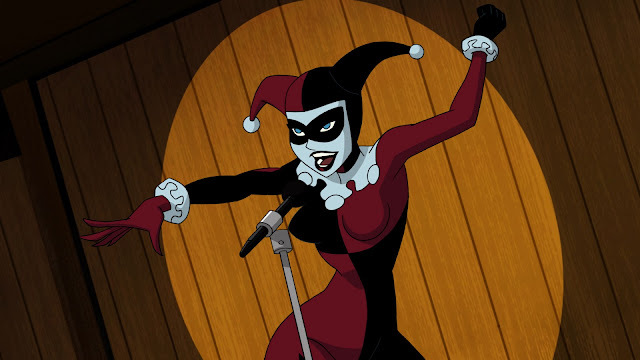 'Batman and Harley Quinn' brings the unlikely team-up of Batman (Kevin Conroy), Nightwing (Loren Lester), and Harley Quinn (Melissa Rauch, in her debut as the Clown Princess) to save humanity. Poison Ivy (Paget Brewster) and Jason Woodrue a.k.a. The Floronic Man (Kevin Michael Richardson) are out to save the planet by any means necessary even at the price of humanity. Batman and Nightwing turn to Poison Ivy's best friend and occasional accomplice Harley to capture the eco-terrorists. In this comedy adventure, Harley is sure to test the patience of Batman with her outlandish personality and peculiar antics. It's much lighter fare compared to last year's DC Universe entry, the controversial adaptation of 'Batman: The Killing Joke.' A much-anticipated title that already carried over the sexual assault and torture, and shooting of Barbara Gordon from the comic, then created a sexual relationship between Barbara and Batman as filler for the film. Needless to say, 'Batman and Harley Quinn' will have much less baggage. It's based on an original story from Bruce Timm. The film will premiere during a special presentation on Friday, July 21st, and will include a post-screening discussion and Q&A with some of the available members of the cast and filmmaking team. Produced by Warner Bros. Animation and DC Entertainment, Batman and Harley Quinn is directed by Sam Liu (Batman: The Killing Joke) from an original story by Bruce Timm (Batman: The Dark Knight Returns) with a teleplay written by Timm & Jim Krieg (Justice League: The Flashpoint Paradox). Co-Producer is Alan Burnett (The Batman). Executive Producers are Sam Register and Bruce Timm. Benjamin Melniker and Michael Uslan are Executive Producers. Batman and Harley Quinn will be available on Digital HD on August 15, and on Blu-ray/DVD on August 29. Animated Batman and Harley Quinn blu-ray DVD Kevin Conroy Nightwing San Diego Comic-Con SDCC video Warner Bros.
Labels: Animated Batman and Harley Quinn blu-ray DVD Kevin Conroy Nightwing San Diego Comic-Con SDCC video Warner Bros.